A lot of people associate pumpkins with just Halloween, but I always think of them as an Autumnal ingredient. Just because October has gone and November is here, doesn’t mean that we can’t use the wonderfully orange gourds anymore! In fact in America they are used traditionally at Thanksgiving for Pumpkin pie. 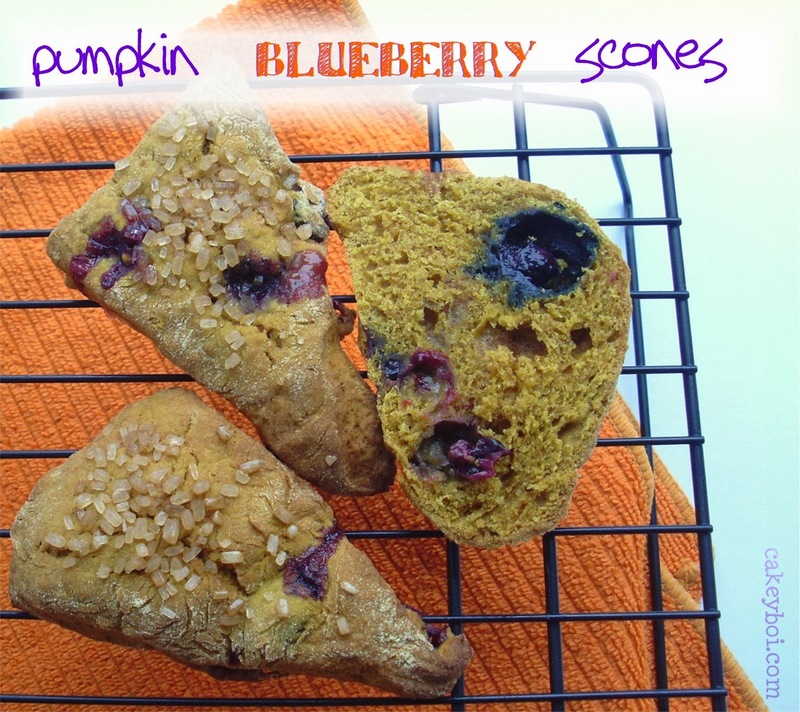 After seeing a recipe online for Spiced Pumpkin Scones, I knew I wanted to make them, but I also wanted to add another ingredient into the mix – blueberries. I love Starbucks Very Berry scones so thought that the two flavours might work well together. I wasn’t wrong and the result were spiced moist scones with bursts of berry throughout. Delicious! I also cut them into triangles, a la Starbucks, instead of the more traditional UK method of round scones. Pureed Pumpkin is available in a lot of places these days in the UK, but if you struggle to get hold of it, it's available online or you could even make your own. Smitten Kitchen gives you tips here. Preheat the oven to 200C. Line a couple of cookie sheets with greaseproof paper and set aside. In a bowl sift together the flour, baking powder, bicarb, salt and spices. Add the butter and rub through until you get a breadcrumb like consistency. In a separate bowl, whisk together the sugar, pumpkin, syrup, soya milk, egg and vanilla. Add the dry ingredients to this wet mix and combine together with your hands until a dough forms. Place onto a floured work surface and knead for a minute. Flatten the dough out to about 10”x 8” rectangle. Sprinkle the blueberries on top and then fold the dough over in half and then reshape to 10”x8” again, so the blueberries are now inside the scones mix. As I said, I don’t use cutters for these. I take a pizza cutter and cut in half length and breadth wise then cut into eighths. Tricky to describe, but take a look at the pic to get the idea (or use cutters, your call). Place each scone onto the baking sheet and sprinkle with sugar so they get a nice crunchy top. I used sugar crystals, but granulated would work just as well. Pop into the oven for 10 to 12 minutes and when they have browned slightly (and the toothpick comes out clean) they are done. Allow to cool slightly on a rack before cutting open and spreading some butter on them. I am also entering these scones into this month's Treat Petite challenge hosted by Kat over at the Baking Explorer. The theme this month is America - and pumpkins and blueberries scream USA to me! Delicious looking scones - I could definitely eat a lot of these. I'm all for scones that don't use cutters - simply because I'm always losing mine. Yep, it's a good idea Phil. I can't take the credit sadly! These look fantastic! I love the addition of blueberry and I am very intrigued as to the taste.